Ok I realize we are rapidly running out of summer, so I wanted to post this now before it seemed silly. If it is not still hot and sunny where you live, find a Miami Vice rerun and play along. 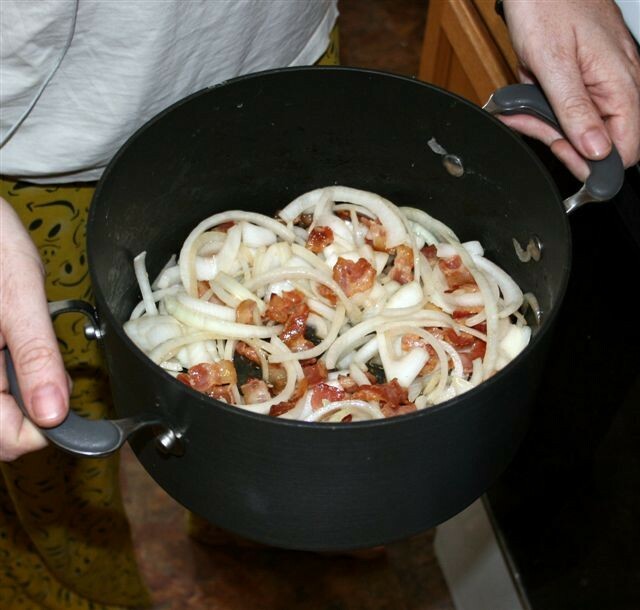 I also won’t be listing any specific recipes in this article, because it’s really more about technique and for the collard greens, I used a method from one of Chef Tory’s cooking classes and I haven’t got his express written permission to post his recipes. Miss Macchiato has assured me it’s fine, but I have a heavy case of idol worship going on here, and the thought of angering him fills me with dread. Also if I have to ask him if I can post his recipes online, it’s a very cheesy way to let him know that I am writing for a food blog. So more on that later! So which is sexier, that pot o’ love, or my smiley face jammies? Tied at meow! 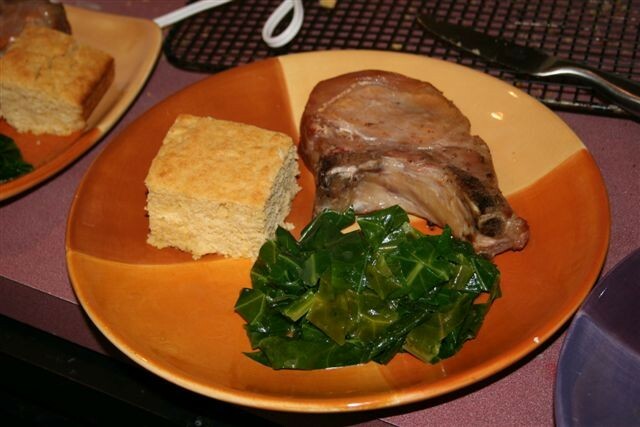 For the cornbread, and the pork for that matter, I followed the basic recipes from Cook’s Illustrated. The cornbread had buttermilk in it, which was a winner. I also used that to make buttermilk ice cream with maccerated blueberries, but that’s another Chef Tory thing, so you’ll have to wait on that one too. On to the main event! This was yet another attempt on my part to get the whole smoking thing to work. I had gotten close before but not what I would consider a win. 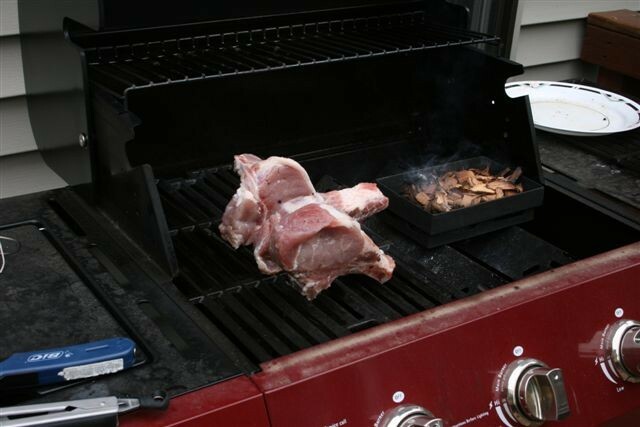 The main change in the technique for this recipe was using a center-cut pork chop and standing it on it’s side, which allows for even cooking without opening the grill to turn it over, which would release all the smoke. 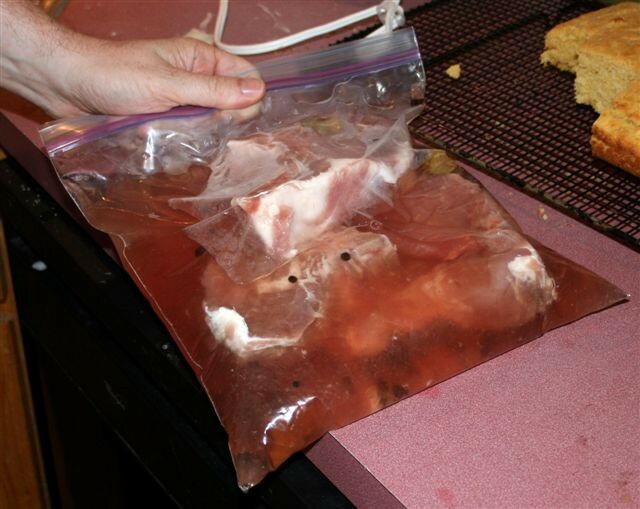 I did take out some insurance and brined the pork, just in case the smoking thing was a bust. Here is the smoking rig I uh rigged up. I did go buy a cast-iron smoke box which has a thing underneath to catch the ashes, which was optomistic on my part and I almost did away with it to get the wood chips more fire contact, but it turns out I needn’t have worried because I HAVE MADE SMOKE!! !